SEOUL -- A science college research team has developed a new bioprinting technology called "aneroin ink" that could be used to print biocompatible and durable 3D constructs such as an artificial human ear. Researchers said the ink can be used to create artificial organism tissues that require transplantation. 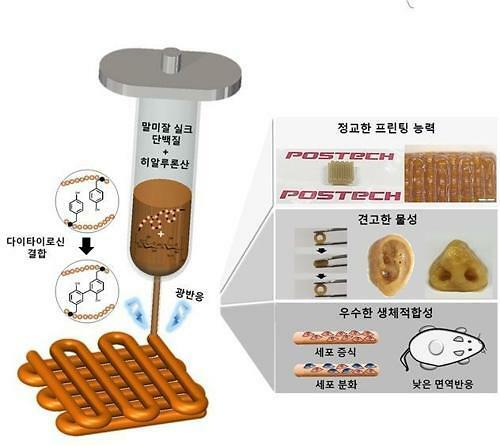 Pohang University of Science and Technology (POSTECH), a prominent South Korean science college, said in a statement Monday that its research team has developed a 3D bioprinting technology which uses a bioprinting ink made of bioengineered sea anemone-derived silk-like protein to print 3D objects. "The 3D bioprinting material, developed from the idea of superior properties and biocompatibility of sea anemone silk proteins, can print complex three-dimensional structures quickly and elaborately," Cha Hyung-joon, a professor at POSTECH's School of Chemical Engineering, was quoted as saying. Scientists are competitively developing 3D bioprinting technologies using organic polymers. Because the ingredients lack in adhesiveness, it's not easy to create physically stable products or 3D constructs with high detail. POSTECH researchers used silk-like protein derived from sea anemones to create a protein polymer with high physical stability. Hyaluronic acid and mussel adhesive protein (MAP) were applied for improved printability and cell adhesiveness. They found the aneroin was more biocompatible than other similar organic material-based 3D bioprinting inks. POSTECH's research was published through the April issue of Biofabrication, a scientific journal.